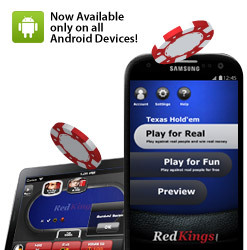 Redkings is the most recent internet poker firm to enter the race of Android apps. It entered this race by launching an app that is going to be used on mobile phones such as tablets and smart phones. This application is called Portable Poker and this app allows the players to place real money wagers and play poker for real money or they can play without paying money in the play for fun mode. This also allows the players to play against and connect with thousands of other players on the Ongame network. The players can play online by connecting to the internet through 3G or WiFi. The VIP manager for the European market, Jack Simons has stated that the new Android app is going to allow the players to play poker online the same way as they play it on their laptop or PC. The online players will be able to open their poker account on RedKings through their tablet or smart phone and they will be able to check offers and make withdrawals and deposits while being outside of their houses or far from their PC or Laptop. According to Jack Simons, the company is going to release an application that is going to be compatible with iOS devices in the future.This Android app is very easy to use and navigate through. The controls are very easy and it allows betting pot, half the pot or all-in. It also allows the player to play no limit, pot limit or fixed limit Hold’em poker.